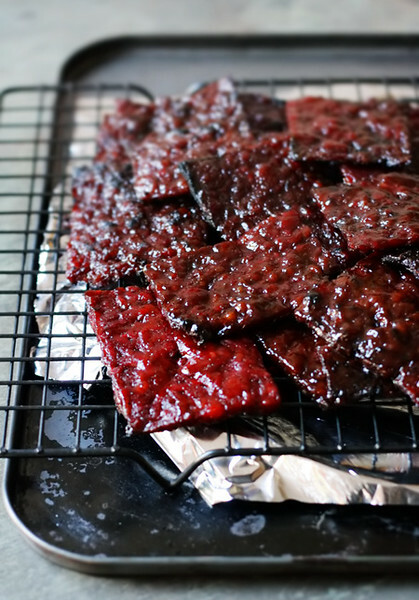 This bak kwa recipe is perfect for Chinese New Year, which is February 5, 2019 and is the year of the pig! give bacon as a gift. 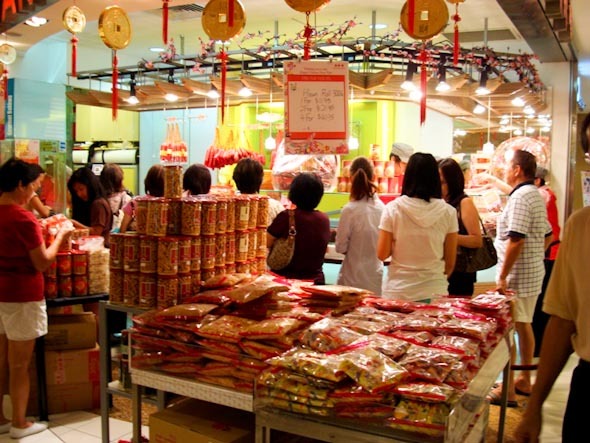 Pork presents are so popular in Singapore that temporary shops have sprung up everywhere to meet the demand for bak kwa in the lead-up to the Chinese New Year. Queuing for the city-state’s finest barbecued pork is considered a Chinese New Year tradition in Singapore. Oh, to be wealthy and have a “helper” to queue for you. Bak kwa is translated as barbecued pork and is usually sold in thin square sheets. It looks like plastic but tastes fantastic. The chewy-sweet-salty porkiness is addictive. There’s a hint of exotic spice, there’s a sweet stickiness that has to be sucked off your fingers, there’s a satisfying chewiness. What more could you want from a meat? The first day of the Year of the Rabbit falls on February 3 this year. And so things are heating up in the already-hot city-state of Singapore. I’ve only ever bought 100 grams at a time so no one has bothered to tell me how long bak kwa keeps for. “It is the embodiment of a perfect gift – a joy to give and a delight to receive,” says the packaging on the first bundle of bak kwa I bought Kim Hock Guan barbecued pork chain. The esteemed Kim Hock Guan, first set up shop in 1905 and is Singapore’s oldest bak kwa making company practicing the “art” of barbecued pork-making. “It is an art that has been refined and continually researched on to satisfy even the finest gourmands,” the packaging says. Rival chain bak kwa Bee Cheng Hiang has an outlet near my local supermarket. It is also good, my Darling Man says it’s better than Kim Hock Guan’s. 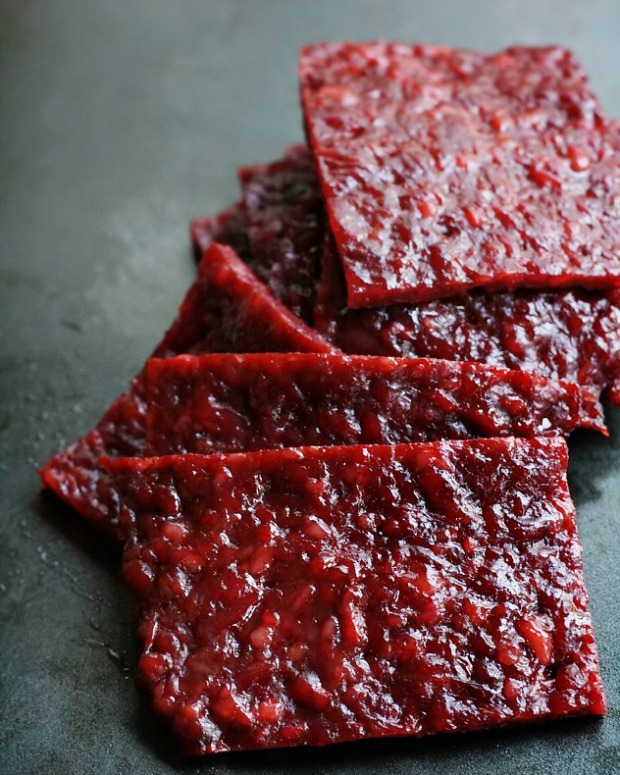 I found a recipe for homemade bak kwa. I haven’t tried it but it looks good. I’m not sure I want to try sticking slices of oily meat into my toaster though. That sounds like something the baby will do soon enough. Although she’ll probably put the meat into the DVD player. This bak kwa post is from The Drop Out Diaries. 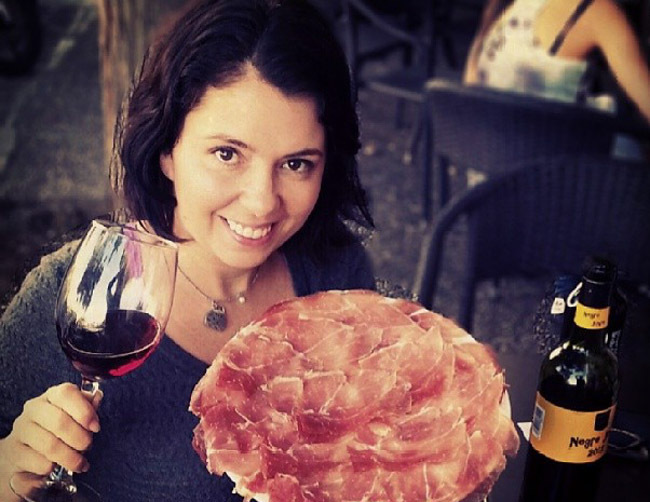 Not only is it about delicious pork but from someone stepping outside her comfort zone. Robyn worked as a political reporter in the press gallery in Canberra before dropping out. Great. I love pork. The pieces in the photos look so crispy and irresistible. Thanks so much for letting me do a guest post on your blog, Ayngelina. 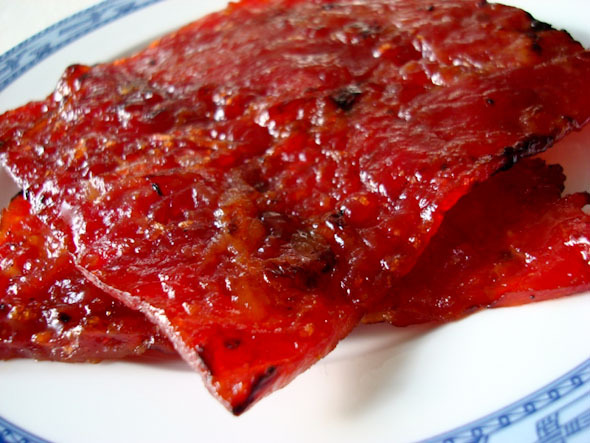 I’m looking at those bak kwa pictures and feeling a VERY strong urge to go down the street and buy more. It is unbelieveably good! I want to bite into that! It looks delicious… and crispy!! Bak kwa looks really good! And I love how you found a guest post about pork. Awesome! The bottom photo looks VERY similar to pig’s ears – my dog’s favourite treats. This looks so good. A really mouth-watering post! Want. all. that. pork. now. YUM. Um, it’s my birthday soon. I know what I want. BACON! This looks great. I love meat, and this sounds like a great appetizer I unfortunately missed when there! Great post Robyn. Looks delicious. Happy New Year! I gotta stop reading food posts before I eat dinner. Starving now. I’ve been to Singapore a few times, I’ll definitely seek this one out on my net trip! Do not try to put meat in the DVD player… I’m just sayin, not that I’ve tried it before. Oh, yeah! I would whole-heartedly welcome bacon as a present!! It’s my bday on Friday- who’s sending me some?!!? I’m trying to think what I would drink with all this pork? A quandry? Oh wow, I missed this when I was in Singapore…doesn’t surprise me, though…all the food is good there. Great piece! Snapping into a Slim Jim just isn’t going to do it for me anymore. I definitely look forward to trying Bak kwa. I don’t eat pork; I just don’t like it. But man, this made me drool. I would totally try it! Glad this is from Singapore and not from South Korea at the mo…lots of pork going to waste up there,,,sadly. That really does look good! YUM! I’ll have to see if my wife can put up a recipe for this delicious pork! Pork as a New Year gift, now isn’t that something. I like the crispy look of it. iÄ’ll be in Singapore in September and make sure to check this out. I’ve never heared of a meat present but seems like a good idea. All my male friends will def appreciate it.. The pictures are great and the meat looks irresistable. holy pork pieces batman, have fun at your retreat! Now that is truly magical! Th pig is such a wonderful fruit! The sweet flavor of that pork is incredible! I was in Macau not long ago and the streets are lined with sheets of BBQ pork…and they offer samples! wow its look so yummy,Still my mouth is melting to seen this delicious, Its look really yummy. thanks for share it. Pork is fantastic and bacon is simply the best. I don’t think Ayngelina could have picked a better person to write a guest post! Especially one centered around bacon. Droll… this is one of my favourite food! Bee Cheng Hiang is the best, I even tried to sneak it out to Canada once, only to get it confiscated! If you go to Sydney, there’s night market in the China Town every Friday, they have it there too. I love Chinese food. These flat BBQ pork sheets are really tasty (I really like the ones with Chilli, not sure how healthy they are though) are so common in China, Singapore, Thailand and other parts of Asia but a bit difficult to get in Australia. This is my favorite. I initially tried this when a Chinese friend gave us a pack of these yummy jerkies. Super love this. Now, I am craving for one.